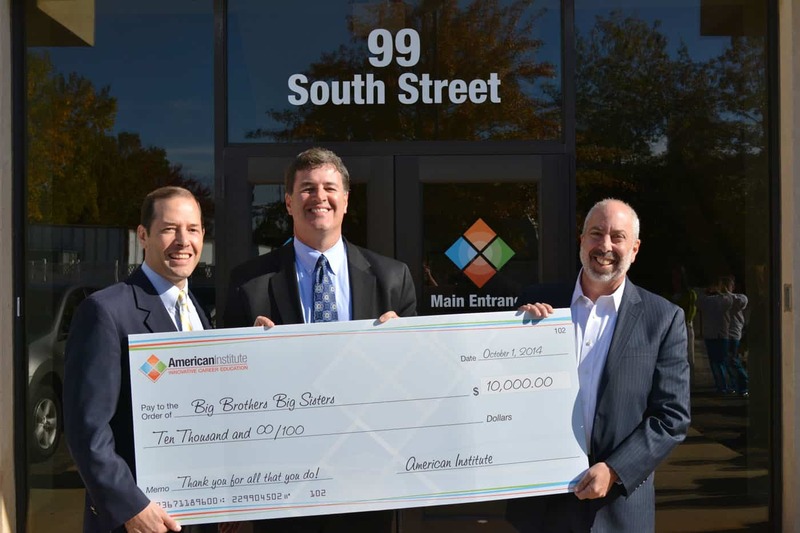 West Hartford, CT— On Friday, October 10th, 2014, American Institute presented Andy Fleischmann, President and CEO of Nutmeg Big Brothers Big Sisters, with a check for $10,000. 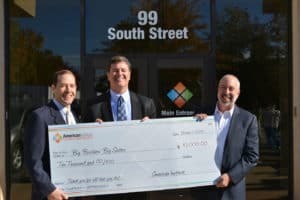 The funds will be shared among each of the local Big Brothers Big Sisters agencies where American Institute schools are located, in addition to supporting the national organization, as part of American Institute’s ongoing commitment to making a positive difference in the communities where we work and live. American Institute has locations in Toms River, NJ, Clifton, NJ, and Margate, FL, in addition to the West Hartford, CT main campus. Each campus held multiple fundraising events throughout the summer to support the Big Brothers Big Sisters organization, as the premier charity partner of American Institute for 2014, raising almost $2,500 from these direct efforts. The company then chose to bring the overall total to $10,000 in honor of all the ‘Bigs’ and ‘Littles’ throughout our American Institute family. Said Chief Operating Officer, Christopher Coutts, “We are so proud of our students, faculty, and staff who took part in the company-wide challenge to support Big Brothers Big Sisters this summer. Many of our students and their families either know someone or have directly benefitted themselves from the Big Brothers Big Sisters efforts, and we’re delighted to be able to raise awareness as well as funds on their behalf.” “We’re so happy to have the support of American Institute as a first year partner raising funds for our mission,” said Charleston Edwards, VP of National Events and Sponsorship. “The funds raised in these communities will greatly impact the odds for at-risk youth in the need of a mentor.” Big Brothers Big Sisters, the nation’s largest donor and volunteer supported mentoring network, holds itself accountable for children in its program to achieve measurable outcomes such as educational success, avoidance of risky behaviors, higher aspirations, greater confidence and better relationships. Partnering with parents/guardians, schools, corporations and others in the community, Big Brothers Big Sisters carefully pairs children (“Littles”) with screened volunteer mentors (“Bigs”) and monitors and supports these one-to-one mentoring matches throughout their course. With nearly 340 agencies across the country, Big Brothers Big Sisters serves more than 500,000 youth, their families and volunteers. Learn more at www.BigBrothersBigSisters.org.